You Have Been Watching…Orphans | Scots Whay Hae! After professing that Scottish cinema needs more light to accompany the shade, it may seem that I’m labouring the point by looking at Peter Mullan’s début feature Orphans. At first viewing Orphans may seem like more grim and gritty Glaswegian fare, but to think that would be a mistake. This is the blackest of comedy, and where that often means simply ‘not funny’ this manages to judge the balance between tragedy and comedy perfectly. Mullan makes serious points about life, death, religion and family, but he also has the audience laughing out loud, often accompanied by the feeling that they really shouldn’t. Orphans is a guilty pleasure in the sense that it makes you feel guilty while you are enjoying yourself. It’s an astonishingly assured first film, which is perhaps not that surprising when you consider not only the films in which Mullan had appeared by this point, but consider the directors who he had worked with such as David Leland, John Byrne, David Kane, Danny Boyle and Ken Loach. Anyone who was interested in directing could only learn good things from such a group of teachers. Orphans was a multiple award winner on the festival circuit, including Best Film at the Venice Film Festival and it deserves every accolade it received. The plot centres around a family who have just lost their mother and examines their different reactions to this loss. The film has been compared to, and is surely inspired by, the writings of Dostoevsky, particularly The Karamazov Brothers. The central male performances by Douglas Henshall (who I’m not a huge fan of, but he is excellent here), Stephen McCole and particularly Gary Lewis are what lifts the film above more mundane black comedies and makes this one of the best Scottish films of recent times. Mullan shows here what has since become obvious; that there are few directors who can coax performances from actors as he can and I wonder if this is because his background is in the theatre. Whatever the reason he manages to get wonderful turns from all his actors no matter what their experience or standing. Gary Lewis has built an impressive career after taking up acting at the relatively late age of 32. From his début film appearance in Shallow Grave he has been in My Name Is Joe, Billy Elliot, Gangs of New York, Ae Fond Kiss and the Irvine Welsh scribed Ecstasy as well as consistently appearing on TV. In Orphans he is big brother Thomas who becomes the head of the family once his mother dies and he takes this role with psychotic seriousness. Thomas is the film personified in the sense that we feel sympathy and empathy for him, but often laugh at the absurdity of his actions. In his desire to respect his mother in death as he did in life he goes to ridiculous extremes, fighting against often supernatural barriers, to fulfil her last wishes as he sees them. Mullan suggests that Thomas is being ‘tested’ by God, and if you believe this reading then you have to admit this test betrays a sick sense of humour. Family is a complicated business, and this is something that Mullan clearly understands. Every one has a familial role which has been created and agreed upon over the years and after a while there is an accepted expectation that those roles will be fulfilled. It often takes a tragedy to shake the family dynamic and this is what Orphans depicts. When people talk about Scottish cinema Orphans is often overlooked, I’ve done it myself, and that is unfair. Perhaps in the wake of the critical success of Mullan’s recent NEDS it will be reassessed. Certainly the aspects of his filmaking that have now become familiar are all there. The magical realism, the easy and unsettling switches between violence and calm, and the struggle to become an adult, which means something different to each of us, are all present. 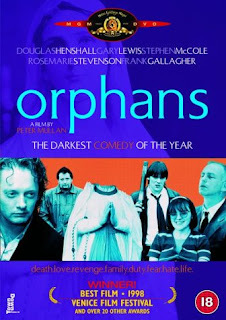 If you liked NEDS then you must track down Orphans as I think it’s a better film, in fact it’s one that everyone would benefit from viewing.